On March 17th ME will be 12 years old and we are already preparing! Yep, we are starting a little early, but we think you will love it when you hear why! If you have followed along with MaryEllen and me you know that the last few years we have been collecting Barbies and Super Hero Action Figures for the patients at St. Jude Children's Research Hospital. It's been a whirl wind of fun. It has also been very emotional to learn what happened to the toys after we delivered them. At the same time it has been very heart warming. We have been so happy to learn that many children turn to them just the same way that ME has turned to her Barbies during the many procedures she has had to endure. Many, many Barbies and Super Hero action figures later we want to thank all of you! Your generous support has been amazing. 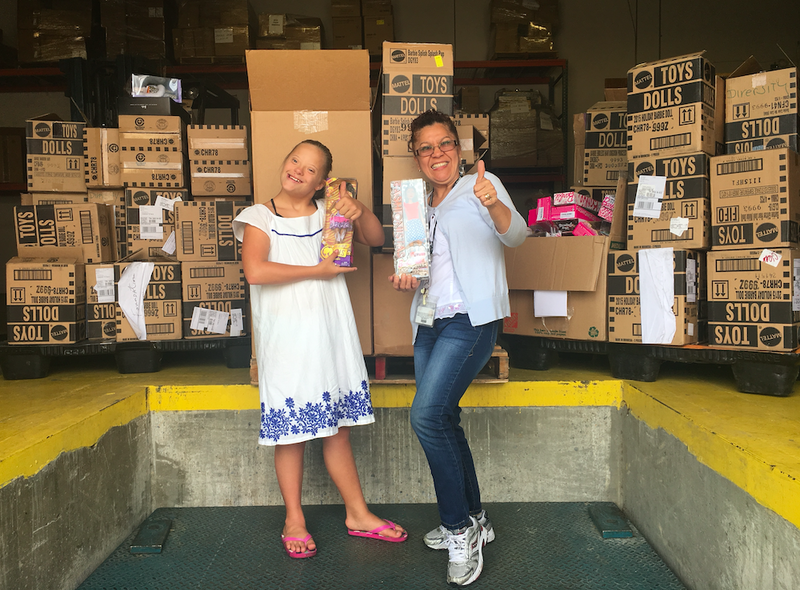 Mary Ellen and Vilma (St. Jude) giving a thumbs up because they are pretty excited about the many Barbies and Super Hero Action figures that have come our way! This was taken at ME's third delivery of toys. So, this year, again, we want to celebrate her life in a really special way! We are thrilled to announce that we are partnering with the University of Memphis Chapter of St. Jude Up 'Til Dawn! St. Jude Up 'Til Dawn was started right here at the University of Memphis 18 years ago, and has spread to over 250 schools across the nation! They raise 5 million dollars a year annually, and they have raised over 20.6 million dollars nationwide for St. Jude! *If you donate through the St. Jude Up 'Til Dawn fundraising page, be sure to indicate that this is for ME's Barbie Party 4 St. Jude in the "leave a comment" section. St. Jude Up 'Til Dawn, Mattel, and I have worked out a process in which we will be purchasing Barbies and Super Hero Action Figures directly from Mattel from their Charity Sales Program. This will be a huge cost savings to purchase them, and it will ensure that St. Jude is getting the toys that they need, when they need them. PLUS every time you donate $12 towards a Barbie, thanks to Mattel's Charity Sales Program that we have been approved to be a part of, approximately $9 of that donation will go to St. Jude Up 'Til Dawn! 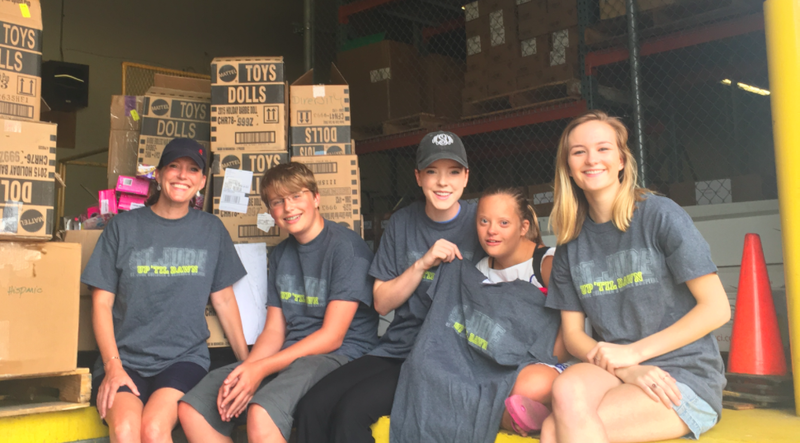 When we delivered ME's last batch of toys we received Up 'Til Dawn t shirts that we are so proud to wear! I want to say thank you, again, to all of you who have given so generously! It has made the difference to many children of all ages who are going through the fight of their life! We hope that you will celebrate ME's twelve incredible years of life again this year by donating $12 to St. Jude Up 'Til Dawn OR sharing this with your friends and family so they can! Barbies have made a huge difference in ME's life, now Barbies and Super Hero Action Figures and your dollars can make a difference in many more children's lives! ** PS As we have said in the past, ME will be 12 all year long, so we will not have a cut off for donations, feel free to celebrate her all year long with us! This entry was posted on Thursday, January 5, 2017. You can follow any responses to this entry through the RSS 2.0. You can leave a response. Well, ME, I turn 70 on March 18th. I can't think of a better way to celebrate both of our birthdays. I will be sending $12 for sure! !